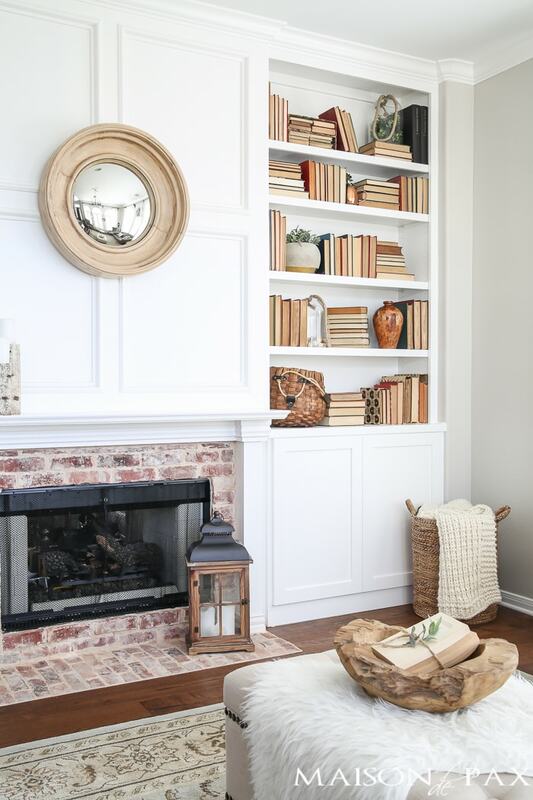 Styling bookcases can be tough, but try these easy tips to help you style your bookshelves like a pro! My kids recently read a Fancy Nancy book that was all about backwards day. Commence lots of eye rolling by mom. 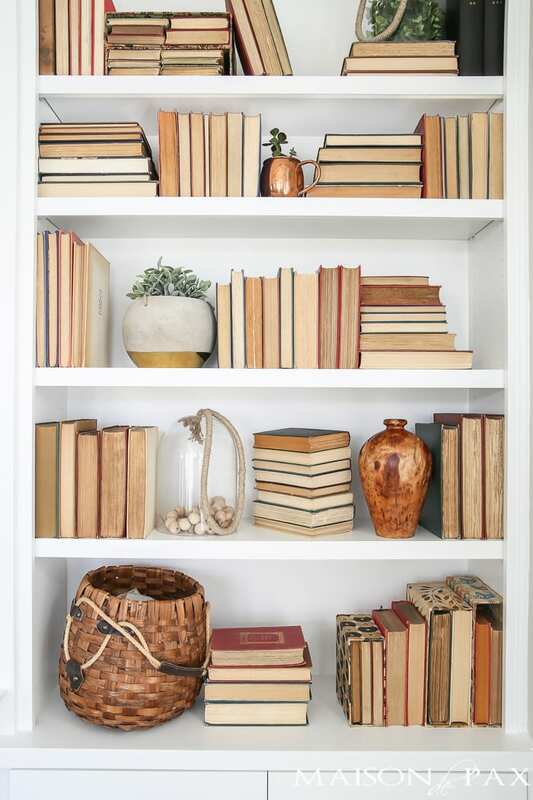 But I digress… the point today is that styling bookshelves can be hard, and I’m here with a few tips that I think can you style any bookcase. 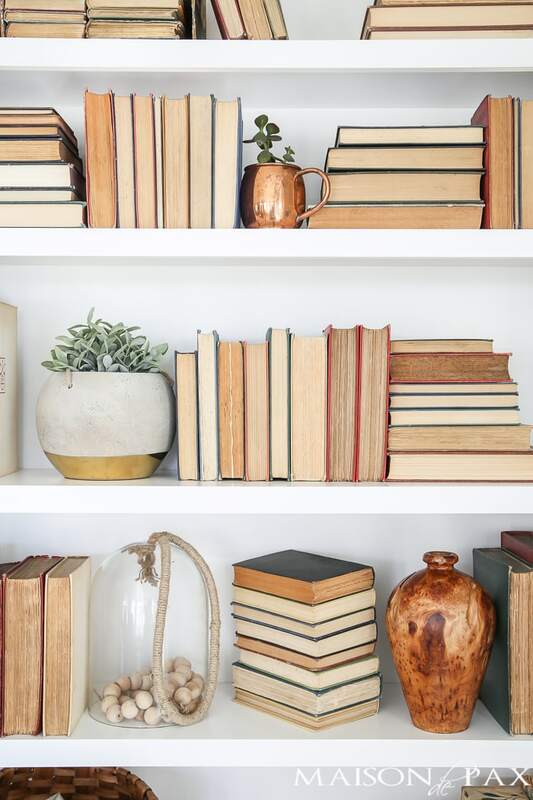 Obviously everyone has different books, different decor, different sized shelves, etc., but these tips should be applicable no matter what you’ve got to work with. This is one of those tips that works in just about any space! But a bookshelf definitely needs the variation. Again, this can apply to more than just bookcases. See the candlesticks on the mantel? For bookcases specifically, though, it can help to group some books by size (don’t overdo it, though). But not too many! Notice the leaning books and the stacks where the edges stair step. This breaks up the square lines of the visual for a little more organic, relaxed feel. Another one of those tips that applies to every space: add a little touch of life! And if you’re worried about having a black thumb, yes, faux is allowed. We built these bookcases because we have… wait for it… BOOKS. And they needed somewhere to live. 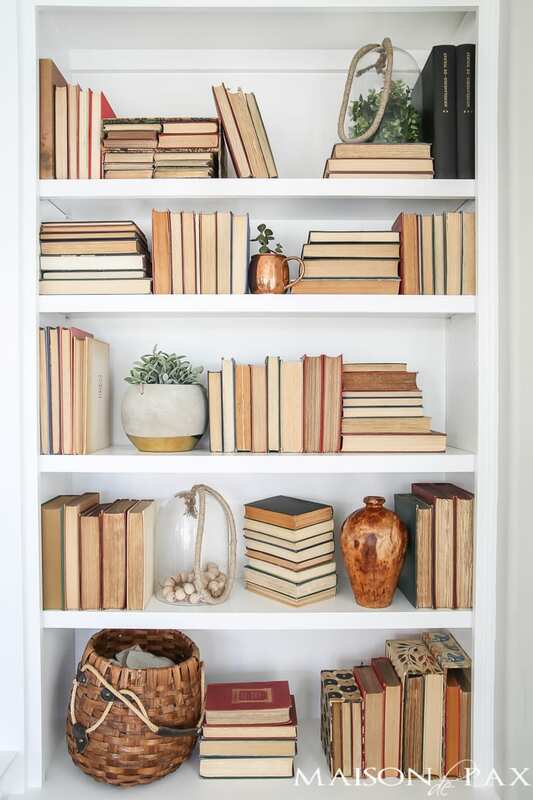 I realize that there are some times when bookcases can be styled with just one or two decorative items and you can call it good, in which case you don’t need to simplify the spaces around it as much. 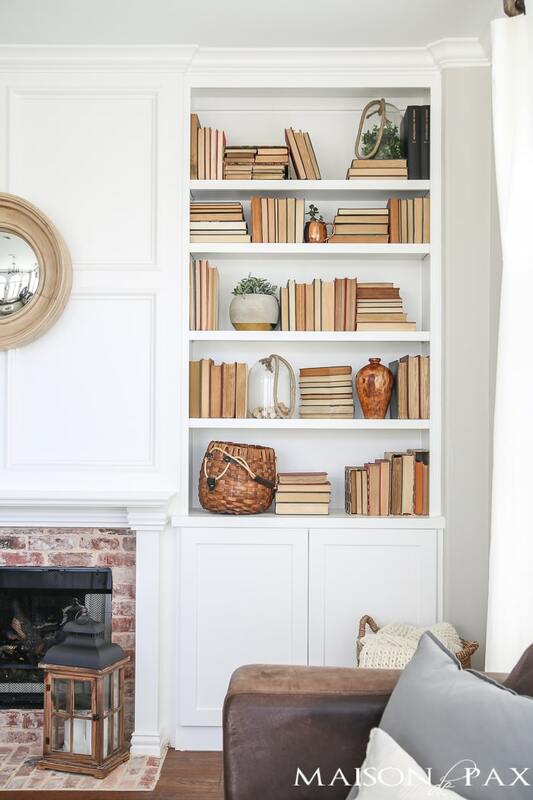 But most bookcases, even if they are styled fairly simply, create a pretty busy visual: rows of books, decorative accents, etc. 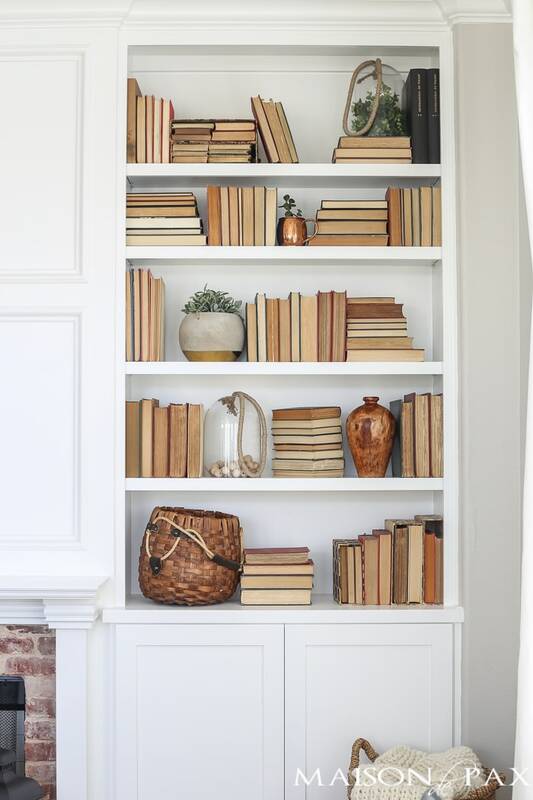 The bookcase will stand out beautifully (and not feel overwhelming) if you keep the surrounding spaces fairly clear. Everything is more fun with a touch of whimsy, right? Bookcases are no exception. My moscow mule mug holding a succulent clipping or my backwards books could both fall into that category here. 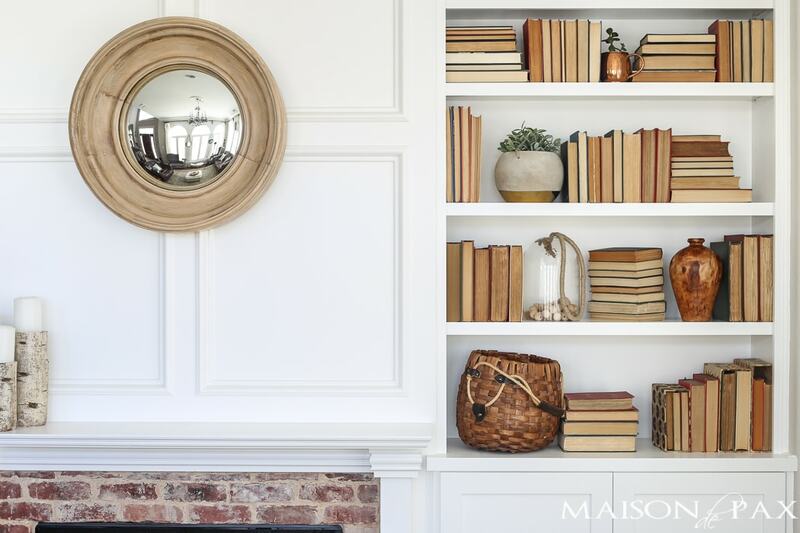 In this case, I have a cloche sporting wood beads, a concrete and gold planter, and an old basket all acting as bookends… I’ve seen some awesome real bookends, but before you go buy a bunch, remember that anything sturdy will suffice! Perhaps the best example of what I mean is the pair of cloches. One is top right and the other sort of bottom left. Not perfectly symmetrical, but balancing each other out. And that’s it for today. What do you think? Any other favorite shelf styling tips? I’d love to hear them! Thanks, Rachel! Great tips! How are you feeling? Praying for you! Lovely vignette! Thanks for the tips! Reminds me of Magnolia Market displays – I was just there this past weekend! Pics on my blog if you want to check it out! You are so sweet, Tina! Thank you so much. Like your style and understand why you turn books backwards but it does not appeal to me. I like to have books accessible to being read and not merely displayed as props. Whoever came up with this fad must not have been a reader. Haha, I completely understand, Rhonda! Truth is, I am a HUGE book lover (former high school English lit teacher here ;), so I’ve refrained from doing this in the past… But these books are almost all antiques that we inherited from a wealthy family member. They are worth something and have sentimental value, so I don’t intend to get rid of them, but they aren’t regular reading material. Some aren’t even in English. I decided that if there were any books I could try this styling on, these would be the ones! Great arrangement of books, colors, and textures. Especially like the diagnoal arrangement of books on the 2nd shelf. On the bottom right, what are the books contained in? I (99%) never comment on people’s book shelves. They would hold books in my house. Some have a million doo-dads and 8 books. It’s their house, not mine. I was able to overlook the books (LOL) and appreciate the beautiful bookcases! Gorgeous as always! Haha… So glad to hear it, Dianne. 😉 Thank you so much! 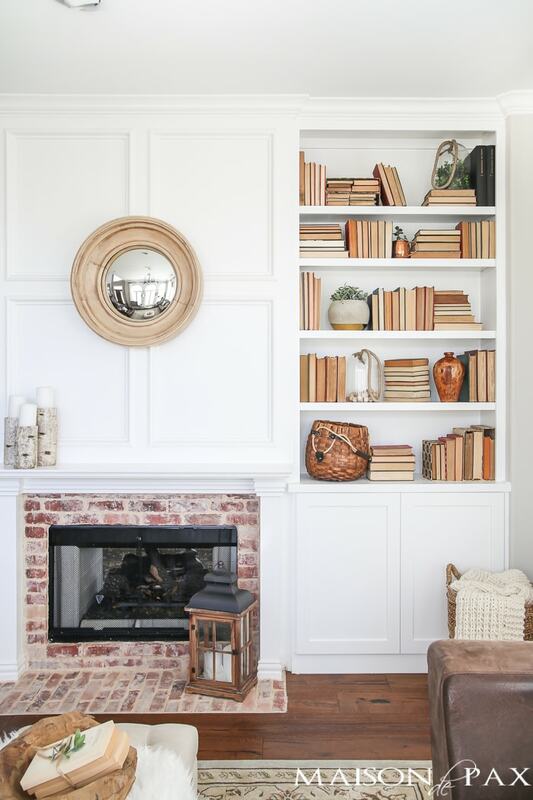 Love your arrangement of books and placement of each shelf. It made me look and mine and see i need to do some with my bookshelves. Thanks, pray your doing well. Rachel, by far the prettiest arrangement of vintage books I’ve ever seen. 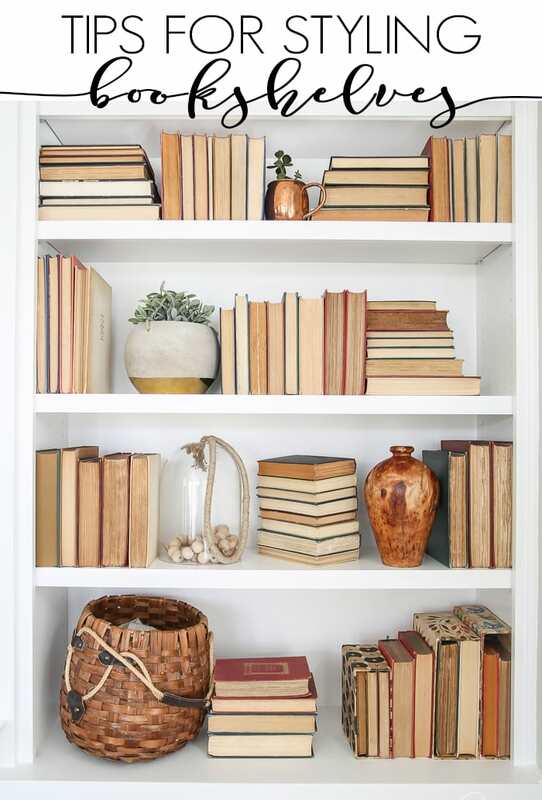 If I ever style a bookcase with some i’ll for sure copy your arrangement! I love seeing the worn pages too 😏 Love your blog BTW. congrats on pregnancy! your shelves look beautiful…we have some nice bookshelves but we use them often…i could never turn my books backwards….well, and I am a color person and love the different colors of our books. I do have a small bookcase that I will give your backwards a try. Thanks for the inspiration. You are so sweet, BJ. 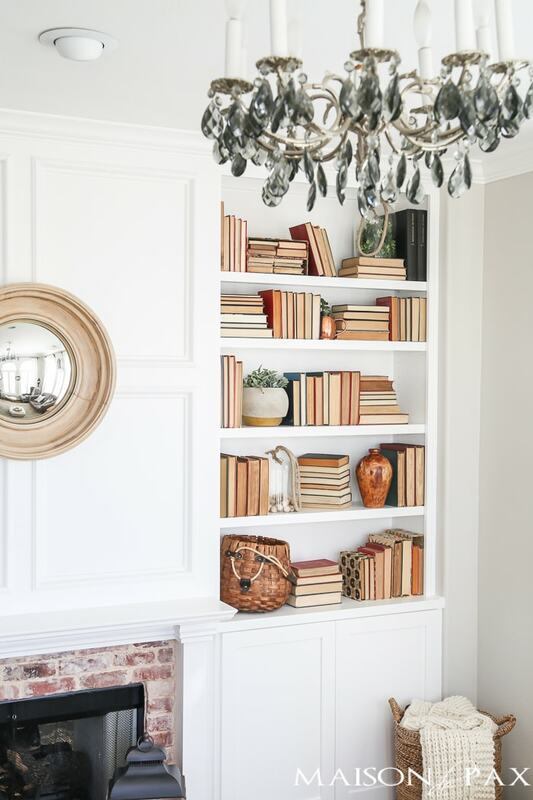 Whatever you do, enjoy those books and the process of styling them! While I am not sure about hiding he bindings of the books, I really like the way the colors of the pages and the round mirrir frame enhance each other. Styling bookshelves is tricky but you have given me a couple ideas to try and I definitely do like whimsey! 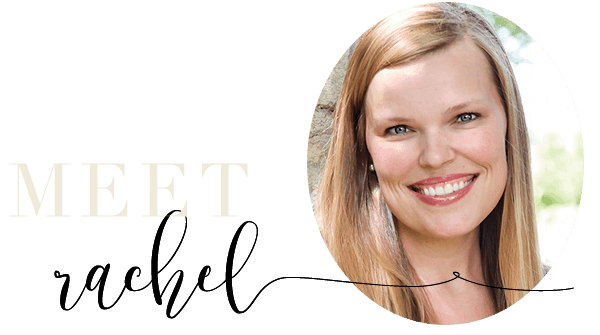 I am a recent “convert” to your blog, and LOVE everything I see! I am glad to know someone else uses their book shelves for BOOKS! Most of ours have been read, also; or oldies from college days that we will never pick up again, so I think I might try turning the books around!! Thank you for the great suggestion of a new style! I have also been known to add a bit of whimsy or something other than books on the shelves, as well. Again, thanks for the decorator suggestion! Oh, and hope the pregnancy continues with you feeling well. I’d hate to miss out on some posts 🙂 Congrats to the whole family! Rachel, What fabulous, creative bookshelves you have designed! I like them so much, I’m inclined to print this page and do my bookshelves exactly the same as your’s. Would you be offended? I studied English in college and in no way do I think you have don nothing to diminish the importance of a single book on these shelves. Books are meant to be enjoyed, whether we are reading them or admiring them as art, the passion is the same. I have been at such a losss with what to do with my bookcases lately, I have just stopped paying attention to them and they show it. Thanks for the most helpful tips and beautiful pictures. I absolutely love this idea! Genius. Thank you for sharing. You’re so sweet, Tracy. Thank you! I love the way you styled your books!!! I think books sitting backward on a shelf would be like setting your chairs upside down or turning your back to someone you are conversing with. One should be able to see the spine of a book to appreciate it as being a book. This, to me, is like an anti-book case; something someone who doesn’t like books would arrange to discourage others from reading the books. Some day (soon, I hope) people will look back on this fad and have a chuckle. I think the bookshelf with the backwards books is visually stunning. Love it. I like to read but it’s not like I’m walking up to my shelf everyday looking for a specific book so I think this would be fun to try. You’re so sweet, Christine. Thank you!